The Senate of the Federal Republic of Nigeria on Tuesday proposes two (2) years jail term for makers of inapt statements on social media. 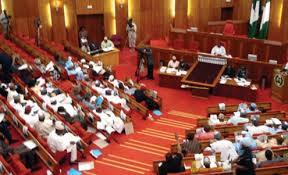 A bill seeking a two-year jail term for any person who makes allegation or publishes any statement or petition in the newspaper, radio or medium of whatever description against another person, institutions of government or any public office holder, passed second reading in the Senate during their first plenary session in the month of December, 2015. The bill also prescribed that anybody or group of persons who send any false text message or post false message on the social media against another person shall be jailed for two years upon conviction by the law court. The bill, tagged: “A Bill for an Act to Prohibit Frivolous Petitions and other Matters Connected therewith”, sponsored by Senator I. Na’Allah, APC, Kebbi South, compels petitioners to accompany their petitions with sworn court affidavit, failure of which attracts six months imprisonment upon conviction. But the bill provides for an option of N4 million for persons convicted of false newspaper, radio and television statements and N2 million for offenders of false phone text messages or messages on Facebook, twitter, Instagram, or WhatsApp. The bill said it shall be an offence for any petition to be submitted without a sworn affidavit from the law court. “Not withstanding anything contained in any law, it shall be an unlawful to submit any petition, statement intended to report the conduct of any person for the purpose of an investigation, inquiry and or inquest without a duly sworn affidavit in the High Court of a state or the Federal High Court confirming the content to be true and correct and in accordance with the Oaths Act. “Any petition and or complains not accompanied by a sworn affidavit shall be incompetent and shall not be used by any government institution, agency or bodies established by any law for the time being enforced in Nigeria. “Any person who unlawfully uses, publish or cause to be published any petition, complaint not supported by a dully sworn affidavit shall be deemed to have committed an offence and upon conviction, shall be liable to an imprisonment for six months without an option of fine. "Any person who acts, uses, or cause to be used any petition or complaints not accompanied by dully sworn affidavit shall be deemed to have committed an offence and upon conviction, shall be liable to an imprisonment for a term of two years or a fine of N200,000.00 or both", the petition read. Senator Na’Allah, in his lead debate, during the plenary, where he sought support for accelerated consideration of the bill, said: “Our past has portrayed us as a society where by mere expedience of writing a frivolous petition against public officials, you can have their right abused by taking certain measures that practically took away their right of presumptions of innocence only to be found later that the petition, as strong as it appears, on the paper actually lacks merit”. “This sometimes, lead to a lot of innocent and most times honest civil servants being taken away from the public service only to be replaced by the dishonest ones, which invariably lead to the draining of the public service of civil servants with the desired integrity to move this country forward simply on grounds of principles. “As a nation with strong desire to move forward, this negative trend must be reversed, if only the desired objectives of the country,” he stressed. He added: "the bill which appears ‘sunset’ in its nature consists of four sections which in clear terms spelt out the punishment for frivolous petition, and what constitutes frivolous petition". “The bill seeks to provide punishment for frivolous petitions by making sure that only credible and verifiable petitions are presented for public use. The utility of the bill is to equally save the time for good governance and resources that go into investigating frivolus petitions. The bill would equally assist in shaping our negative thinking by elevating hard work over and above sychophancy and indolence”, he further explained. “The question to ask is, whether having passed the Freedom of Information Act which gives unfettered access by the public information from government offices they would be right for this government to continue to waste valuable time and resources in investigating frivolous petitions from the same public and I am sure you would find no difficulty in saying no to the ugly situation”, he stressed, while soliciting support for its consideration. What's your take on the contents of A Bill for an Act to Prohibit Frivolous Petitions and other Matters Connected?